The Robert J. Shepherd Economics Accounting Path Scholarship Award was established by Kristi and Thomas Patterson to honor retired senior lecturer Robert Shepherd. This award recognizes one or two students of high academic standing in the advanced accounting series and overall academic merit achieved by economics majors. Robert’s family established this award to honor his pivotal role in shaping and leading the accounting path within the undergraduate economics programs at UC Santa Cruz. 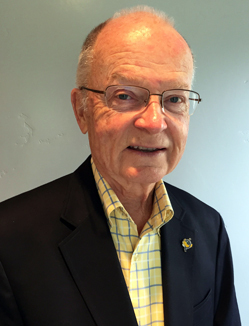 In 2015, Robert J. Shepherd, CPA, returned as Senior Lecturer in the Economics Department after having developed the accounting path, and directed the accounting program for the Economics Department at UC Santa Cruz. He was the recipient of the 2011 and 2001 Excellence in Teaching Award and the 2015 CalCPA Outstanding Accounting Educator Award. Shepherd has taught undergraduate, intermediate and graduate level accounting courses to over 18,000 students and played a major role in the curriculum planning and course development of the Business Management Economics Program, which has become one of the largest majors at UC Santa Cruz.